There are 55 Ayleid ruins in Cyrodiil. In addition, the 35 Ayleid Wells found in various locations (many near Ayleid Ruins) were also built by the Ayleids. The jewel Chim-el Adabal, which is seated in the Amulet of Kings and contains the souls of the Emperors. 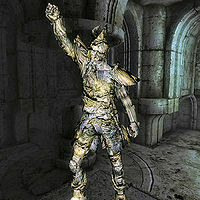 The Ayleid Statues collected during the quest The Collector. The Staff of Nenalata found during the quest Secrets of the Ayleids. The Ayleid Crown of Nenalata found during the quest Secrets of the Ayleids. The Ayleid Crown of Lindai found during the quest Secrets of the Ayleids. The Ancient Elven Helm found in Vahtacen during the quest Vahtacen's Secret. Welkynd Stones found in most Ayleid Ruins. Varla Stones found in most Ayleid Ruins. Umaril's Sword found during the quest Umaril the Unfeathered, if you have installed the Knights of the Nine official plug-in. The Ayleid Battle Axes wielded by Aurorans, added by the Knights of the Nine official plug-in.